Crochet this stashbuster popcorn stitch afghan square in any colors to match your home decor or your favorite season. This 12″ crochet afghan square is perfect for decorating your home from the living room to the bedroom. It has a pretty flowery look that will go great in any summer or winter afghan, or in decorative pillows. And if you love bags, simply piece two squares together, add a handle and a simple lining and away you go! The pattern recommends a medium worsted weight yarn, but depending on where and what you want to use this for, you might be able to substitute other yarns and hook sizes as well. 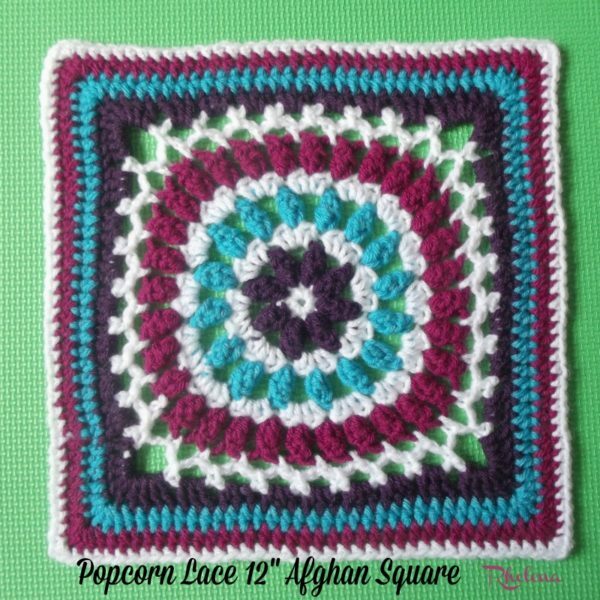 This afghan square is part of the Moogly CAL of 2016. And this year we also have a French Version available for you. Hope you enjoy! You can pair this beauty with other 12″ patterns such as this picot square and the bullion stitch square. If you enjoy the popcorn stitch, you might also enjoy this 3″ crochet flower afghan square. Yarn: Vanna’s Choice (100% acrylic, worsted weight #4, 3.5 oz/100g – 170yds/156m) – 4 colors: (A) White, (B) Eggplant, (C) Aqua, and (D) Magenta. Gauge: 3.5″ over first 3 rounds. Finished Size: 12″ after blocking. Beginning Popcorn (Beg Pc): Ch 3 (counts as first dc), work another 2 dc in same st, remove hk from lp and insert from front to back into first dc made, pick up the lp and pull through. Popcorn (Pc): Work 3 dc into st indicated, remove hk from lp and insert from front to back into first dc made, pick up the lp and pull through. 1. New colors are joined in the joining slip stitch of the round. 2. Change colors as desired. 3. Carry unused colors up at beginning/end of each round. 4. 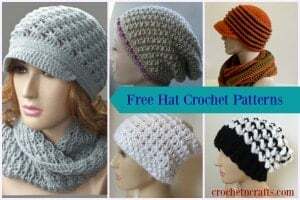 Alternatively, for a clean backside, fasten off each color as you finish it, and then begin the next round (new color) with a standing crochet stitch. Refer to this tutorial on standing crochet stitches. Did you enjoy this pattern? Then why not check out more awesome 12″ Crochet Afghan Squares at CPB. Not happy with options of either print or e-mail for saving the pattern.